A cizhou circular stoneware dish, supported on a short ring foot, the sides flaring out towards the rim. 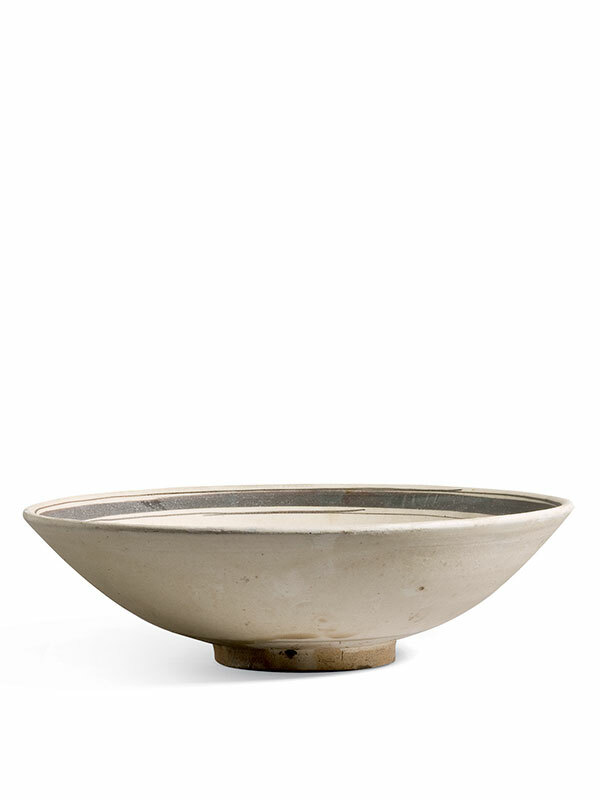 The interior and the exterior of the dish are covered in a layer of white slip, which stops well short of the foot, where it exposes the buff stoneware body. 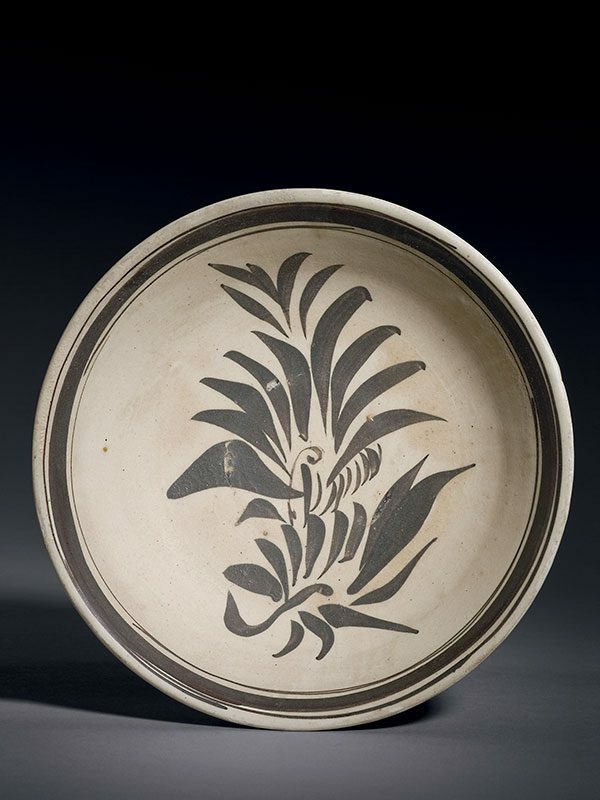 The interior of the dish is painted under the glaze in black with boldly depicted, stylised flowers, encircled by a broad concentric band around the rim, flanked by two lines. The dish is applied with a transparent glaze of ivory tone with a slight green hue, which stops in an irregular line and forms a few teardrops. The lively colour contrast of this cizhou stoneware dish, painted with a flower design in black onto a white slip ground, represents the most successful use of brushwork on Chinese ceramics. A closely comparable Song dynasty cizhou type dish, also painted with a spray of leaves in black, but slightly smaller in size, was excavated from the Dangyangyu kiln in 2004 and is now in the collection of the Henan Provincial Institute of Cultural Relics and Archaeology. [2 ]A cizhou type dish of similar size and with a painted flower decoration on the interior, excavated from Kaesong city in the southern part of North Korea and dated to the Jin (1115 – 1234) to Yuan (1279 – 1368) dynasty, is in the collection of the National Museum of Korea. Two further comparable dishes, both dated to the Song dynasty, are respectively in the collections of the Victoria and Albert Museum and the Ashmolean Museum in Oxford.